Ok, I have run into a new issue with the car. I have installed the bump steer spacers that go between the rack and and aluminum front brace. 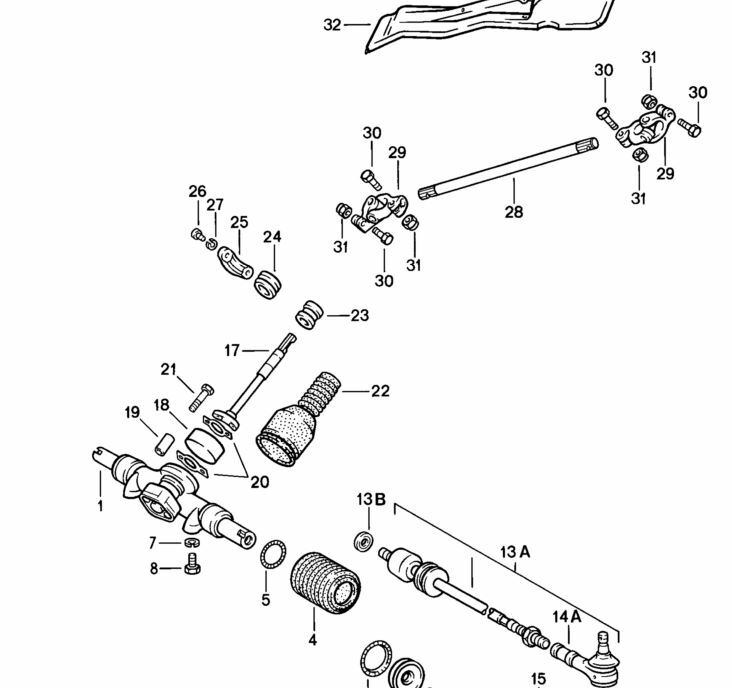 Now when I turn the steering wheel I get a clunking sound like the universal joints (#29) are bottoming out. It goes away when I loosen the 2 Allen bolts (#25) that hold the rubber grommet (#24) in place. Maybe loosening bolts #30 will let the splined shafts slide into the U joint coupler farther therefore reducing lateral tension on the u joint created by raising up the steering rack around 10mm with the bump steer reduction spacers. That's what I did when installing weltmeister bump steer spacers and longer bolts that came with them around 8 years ago and I've never had any problems of any kind with the steering. The original steering rack bolts are holding a toilet seat on now. I have already loosened the bolts and slid the splines in as far as possible. Well, it seems like there is still tension on the u-joint(s) if loosening the two bolts that hold that bracket in place lets the steering wheel turn smoother. The splined shafts have a groove cut into them where the u-joint bolts go through so maybe widening that groove a little with a carbide bur in a die grinder will let the splined shaft(s) slide into the u-joint farther. Just a guess... and you can always take the steering rack spacers back out. They aren't the best way top reduce bump steer when lowering ride hight. Raising the spindles on the struts is the better way, but yeah that's time consuming and expensive. How many miles are on the car? Maybe the steering column u-joints are a little worn out. Mileage I not the issue. Car sat since 93 and if I remember. Under 30k on the chasis. I'll check the joints and the channel. Maybe I am off a spline and it's keeping me from sliding it all the way in. Though by looking at then joins. They all appear to be at the same depth. I may remove the spaces and get a bump steer kit from Rebel if I can't figure it out. You may need to file the keyway on the rack input shaft to allow the uni joint to settle lower and relieve the pressure on it. In reading about your build, I think this is the only way to go. Every other aspect of it is top drawer so you might as well fix your bump steer with the best option.